Happy Thursday! Robin here with my Dies R Us design of the week. This week I chose to use Memory Box Toulouse Background and Impression Obsession's Square Cutout Border dies as my starting point for my card. Having a die, like the Toulouse Background, with a frame built in makes designing a card easy; it's almost done before you know what happened. I added a contrast piece of CS behind the Square Cutout Border which was placed behind the Toulouse Background. I incorporated the long leaf stems into the Square Cutout Border with a few snips here and there, just to make it look like they were growing through a fence. TIP: Don't hesitate to trim or snip your die cuts to fit your design or idea. 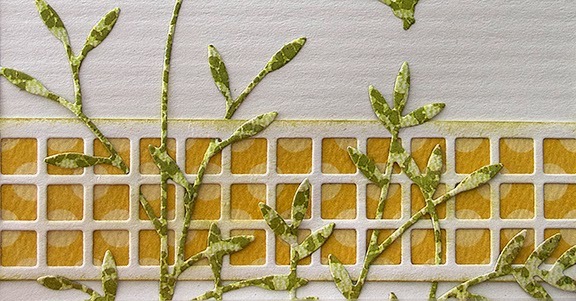 A strip of heavy weight vellum is stamped with a simple sentiment from Waltzingmouse Stamps. 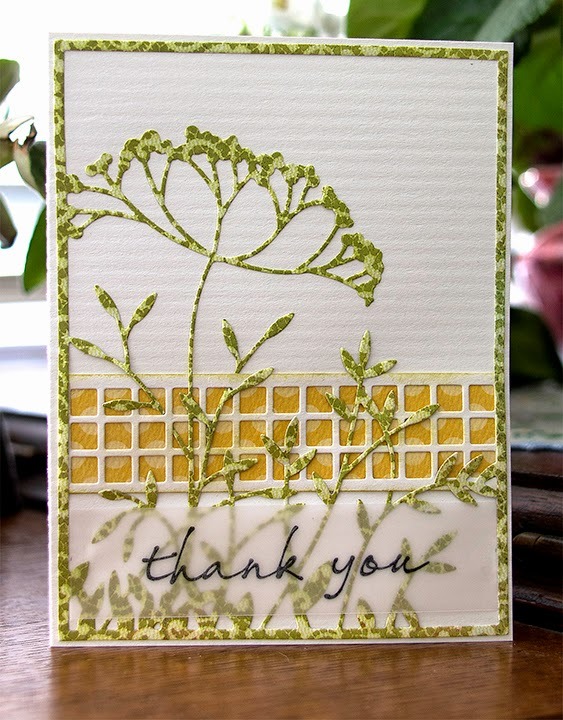 My card base is one of my favorites from Neenah, called Columns; a simple texture in the CS that adds that little something. Don't forget DRU is having a Design Team Call for our NEW Challenge Blog! AND stop by our shop for the latest in dies! Until next week… thanks for stopping by, Robin! Oh WOW this is so cool looking Robin! Thanks for inspiration! A beautiful card, Robin! I love the textured cardstock behind your dies as it really makes them pop out! And stamping your thank you on vellum is a great way to add your sentiment without covering up any of the beautiful dies! Great design! !